Late Sunday evening, Oklahoma experienced a 5.0 earthquake—its fifth largest on record. The earthquake struck just a couple miles outside of Cushing, OK, home to one of the world’s largest oil storage terminals and a town that’s nicknamed the "Pipeline Crossroads of the World." This damaging earthquake is part of a worrisome trend in which an unprecedented number of earthquakes are striking across the state—a phenomenon tied to wastewater disposal wells that deal with the leftover fluid from hydraulic fracturing, or fracking. These wells shoot the wastewater deep underground to depths even farther down than where oil and gas are found. A report from the Oklahoma Geological Survey (OGS) in 2015 found a connection between fracking and the state's increase in earthquakes, especially “earthquake swarms,” or series of small earthquakes. Last year the state saw 907 earthquakes, and the year before a total of 585 earthquakes of magnitude 3.0 or higher struck, more than in the previous 35 years combined. In September, Oklahoma experienced its largest earthquake on record, a 5.8 tremor near the town of Pawnee in the northeastern part of the state. According to the United States Geological Survey, there’s been about two dozen earthquakes across the state in just the last week—one of which was a 4.3 quake just 25 miles north of the center of Sunday's quake. The heavily contested Dakota Access Pipeline in North Dakota, which would transport nearly 500,000 barrels of fracked oil per day to Illinois on its way to refineries in the Midwest, East Coast, and Gulf Coast regions, would add to the growing pipeline network with epicenters in places like Cushing. While #NoDAPL protesters are primarily concerned with potential oil spills near key water sources and the desecration of sacred or important lands, an increase in earthquakes in places not typically prone to such upheaval is another side effect of relying on fossil fuel infrastructure. The more pipelines, the more oil that can be unearthed to fill them; whether this oil comes from Canada's tar sands or the Oklahoma countryside, there are serious environmental risks, both locally and globally with greenhouse gas emissions contributing to climate change. Even Oklahoma's oil-friendly government has been forced to take action to curb the outbreak of quakes. Last March, Oklahoma ordered a 40% reduction in fracking wastewater injection volumes covering an area about the size of Connecticut in the central part of the state. 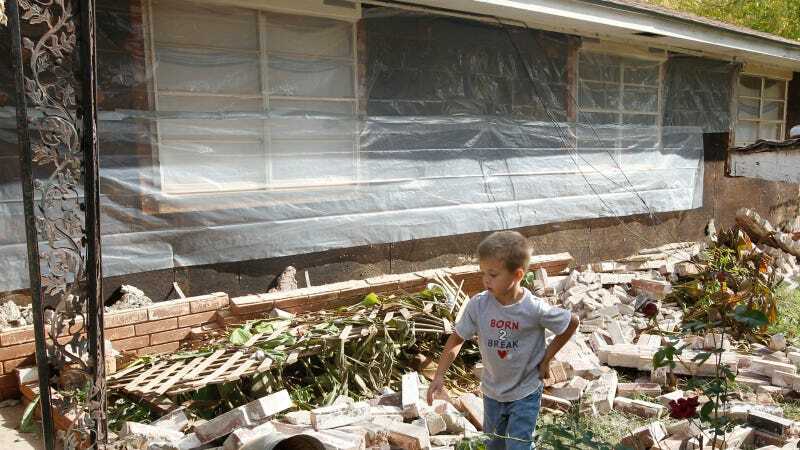 This order followed a similar one from the month before for northwestern Oklahoma that was instituted after the state felt its third-strongest earthquake ever recorded. According to the Associated Press, on Monday morning “television news footage showed widespread, substantial damage to buildings, with piles of bricks and other debris littering the ground.” A few people were reported to be injured. Megan Gustafson and Jonathan Gillespie, who were working at a Cushing McDonald's when the quake hit, told local news that "it felt like a train was going right through the building, actually." "I kind of freaked out and was hyperventilating a bit," she said. According to Reuters, Cushing authorities are evacuating the downtown area due to gas leaks and infrastructure inspections. While the town recovers, the area's oil operations have already returned to normal, according to Oklahoma Corporation Commission (OCC) spokesman Matt Skinner. Skinner said state regulators are considering whether to shut down or restrict activity at some disposal wells. As of late October, the "tank farms" in the vicinity of Cushing held 58.5 million barrels of crude oil.